The software is breeze to use regardless of the complexity of your workflows, as it monitors and processes changes in real time, and lets you complete and approve operations in cloud. Thus, there is no training or maintenance expenses to be worried about. Why choosing Promapp? In a field as competitive as digitized process management, there are only several apps that revolutionize operations and genuinely impact the way business is done online. Promapp, for instance, allows business teams to convert their robust process maps, Visio charts, and procedural documentation into simple visual tools everyone can access and understand. What users like even more about it is the streamlined navigation, and easy sharing and exchange of files and processes. The core of this system is the business mapping tool, an intuitive process management asset with a central, cloud-hosted repository for all important information. The rationale behind this asset is ensuring smarter and safer working practices and simplified methods, for the purpose of which Promapp also provides risk management, quality assurance, and business continuity tools. An advantage to consider is also the seamless integration with any EDRMS, including SharePoint or any other intranet. The open API infrastructure of this system will allow you to use it in synergy with any third-party app, and hence make minimal adjustment in your current software landscape. Despite of its appreciable connectivity, Promapp still remains one of the best secure business process management systems, where all data is protected with SSL 128 bit encryption, and stored on multiple servers to ensure painless retrieval. Promapp is also a moderately priced system, made affordable to mid-tier and developing market participants. Planes are calculated and distributed on quote basis, meaning that each user receives a personalized package that meets his needs. All you have to do is to visit the company’s official website, and contact their sales specialists. Promapp is officially one of the most preferred mid-market choice for successful business process management, and owns such attribute to its one-of-a-kind personalized navigation. 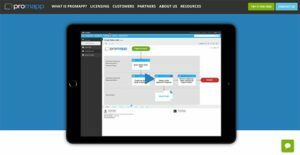 Unlike most BPM systems that promise uncompromised customization, Promapp does in fact depend on the users’ creativity when designing workflows, and thus resembles the company’s operating habits just as they are. As our experts like to put it, Promapp does indeed allow customers to own their business processes, and be in charge of and accountable for improving them. Promapp is one of the simplest process mapping systems currently available on the market, as it was designed with everyday users in the first plan. Users will benefit from intuitive and hassle-free navigation patterns, and maximize the potential of its features without any training or expertise. As we mentioned before, the highlight of this system is personalized navigation, as all processes are planned in line with the user’s mode of operation, and he can see them as ‘Processes I’m in’ and ‘Processes I own’. The user will also be allowed to prioritize between tasks and processes, and pinpoint favorite ones. If looking to map processes with only few clicks, look no further than Promapp. The simple and clean interface that has become the trademark of this system will let you move between processes without difficulties. You can write processes in text to generate dynamic process maps, drill down to guides, forms, or policies, or use quick search to save some additional time. Promapp users will be able to complement their process improvement methodologies with an array of tools and guides, notation styles, and expert advice. Among others, Promapp will complement ISO, LEAN, and SIX Sigma methodologies with simplified process descriptions, and ensure users can adopt them as soon as possible. Promapp is also a collaboration-friendly system that supports comments and suggestions on personalized dashboards, and doesn’t obstruct exchange of files. Users will also be able to chat with each other and rate improvements, and all of their conversations will be stored in a centralized database. Promapp simplifies quality management and maximizes the return from your QM systems with a unique change control methodology. With this system in place, your stakeholders will receive instant email notifications for each change, and each process version will be permanently stored in special change logs. Promapp allows you to run successful and efficient risk management programs that monitor and analyze perils throughout the entire value chain and all key activities, including the role of suppliers, customers, partners and key stakeholders. Once all risk and compliance requirements are embedded into your processes, risk management becomes an easy, day-to-day activity instead of a cumbersome and error-prone procedure. Driven by the idea to create an end-to-end BPM tool, Promapp’s developers dedicated special attention to the product’s HR capabilities, and enabled workforce management teams to get rid of complex manuals and flowcharts. Instead, they can use detailed HR templates to lay out the basics of all employee management duties, including hiring staff and dealing with serious breaches and misbehavior. If you are considering Promapp it may also be sensible to analyze other subcategories of Best Business Process Management Software collected in our database of B2B software reviews. Every enterprise has its own characteristics, and might call for a special Business Process Management Software solution that will be designed for their company size, type of customers and staff and even individual industry they support. We advise you don't count on finding an ideal software that is going to be suitable for each business no matter what their background is. It may be a good idea to read a few Promapp reviews first and even then you should remember what the software is intended to do for your company and your workers. Do you require an easy and intuitive app with only essential features? Will you actually use the complex functionalities required by experts and large enterprises? Are there any specific features that are especially beneficial for the industry you operate in? If you ask yourself these questions it will be much easier to find a solid service that will fit your budget. How Much Does Promapp Cost? We realize that when you make a decision to buy Business Process Management Software it’s important not only to see how experts evaluate it in their reviews, but also to find out if the real people and companies that buy it are actually satisfied with the product. That’s why we’ve created our behavior-based Customer Satisfaction Algorithm™ that gathers customer reviews, comments and Promapp reviews across a wide range of social media sites. The data is then presented in an easy to digest form showing how many people had positive and negative experience with Promapp. With that information at hand you should be equipped to make an informed buying decision that you won’t regret. What are Promapp pricing details? What integrations are available for Promapp? Pros: Promapp is made for knowledge management processes, documentation, risk management and improvements. We can easily engage the workforce thanks to its simplicity. Cons: I don’t want to use the word “dislike” for this product, the truth is that it needs some improvements. I cannot click into the Risk register from Risk tab in the dashboard, so I have to navigate it back out to the register and then open the risk, that’s the only thing that needs improvement. Pros: We easily implemented this software to our system, our users find this software easy to use, they are able to sign off, refer, suggest between the processes and risks. They are able to capture all the work and targets from single place, to keep records and history of the improvements. Cons: It requires some knowledge and good understanding of this product. We have some struggles in keeping the dashboard clear. Promapp is easy to use and it makes the managing processes much easier. I am able to access the processes online whenever I want.